After finally finding the perfect set of tuner-style rims to set-off your exterior, make sure you mount them right – with a secure and stylish Mr. LugNut Spline Wheel Installation Kit. Each Mr. LugNut Spline Wheel Install Kit is designed to meet or exceed OEM standards to ensure reliable performance. Available in several different thread sizes and colors, the Mr. LugNut Spline Install Kit is sold in sets for 5-, 6- and 8-lug models. You Mr. LugNut Spline Style Lug Nuts also available without the kit, sold as a set of 4. 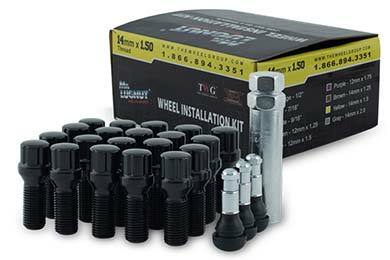 Your Mr. Lug Nut Spline Wheel Install Kit comes with a 90-day finish warranty and 1-year limited structural warranty. The exterior of the lug nut looked great. But thats where it ended. The interior Machining tolerances were not exact. Some had machining that needed to be cleaned out of threads before you could install and others would wobble on the tread until it could be tightened up. Made me feel uneasy. Reference # 753-672-854 © 2000-2019 AutoAnything, Inc.